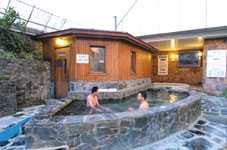 Facilities there include hot, lukewarm, and cool baths, dry sauna rooms, fountains, showers, a half-bath with tables, and massage and exfoliation services. There's an open-air section with a couple baths and another shower area. 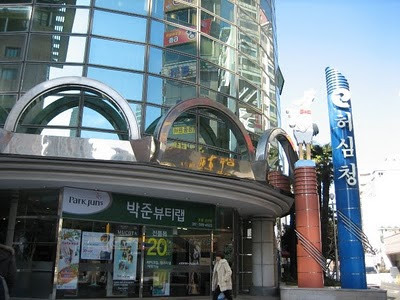 The alkali spring water emerges at 45°C to 56°C and has the highest concentration of magnesium in Korea. Forty different bath types are available during different seasons, including cherry, pepper, champagne, lavender, or citrus water. All baths use natural ingredients such as salts and medicinal herbs. There's even a large cave-type bathing area with several tubs of different temperatures. This large, open sauna is a wonderful place to relax. From the locker room you'll find the entrance to the jjimjilbang area where you can enjoy laying on a heated floor and watching TV in the main room, relaxing in one of the smaller rooms, enjoying doctor fish foot treatment, or eating carefully prepared traditional Korean foods at the snack corner or restaurant. The yellow ocher, jewelry, and charcoal rooms are all quite hot, but dry feeling. The segregated sleeping rooms, found at the ends of the two halls, are dark and quiet, and a comfortable resting temperature. There is room called the Aroma Room where you can lay below peaceful, if plastic, green bamboo and treat your lungs to highly oxygenated air. Another small room is the igloo-shaped ice room; this is usually one of my favorite places to hang out. Unfortunately, the ice room was closed due to H1N1 (swine flu) concerns this fall. For an additional cost, you can indulge in mug-wort cauterizing therapy with moxa (moxibustion), which stimulates circulation and improves qi. In my opinion, Hurshimchung's strength is clearly the sauna. The jjimjilbang itself is cozy and I kept feeling like there should be more space. (Where do those 3,000 people hang out?) On the other hand, the sauna is spacious, appropriately lit, and has many different areas to explore. Almost the opposite of other spas I've visited, I found the sauna offered greater variety than the jjimjilbang. So, if you enjoy bathing in spas or want to check out a Korean sauna for the first time, Hurshimchung is sure to provide you with a great experience. 5:30 am until 10 pm everyday.